There are ways to work with the strengths of both colors in a Green-Gold clash, but to do so requires extra work on behalf of the parent, especially when it comes to selecting curriculum. Traditional workbooks and modes of learning may feel familiar and comfortable to a Gold parent or child. Conversely, hands-on child-led learning activities (including project-based homeschooling and unschooling) may work better for Greens, especially if Orange is their secondary color. Parents in a Green-Gold dynamic may want to “split the difference” and find ways of performing and documenting work that makes both student and home educator content. Doing so will increase the odds of a successful experience for everyone. • Which colors are expressed in your family? Are there any natural alliances or clashes that may be a result of personality similarities or differences between siblings? How might understanding these differences help minimize misunderstandings, especially in a homeschool setting? • Look at each child and their teachers, educators, your spouse or co-parent, and your own personality. Are there natural conflicts that may result from personality or temperament differences? How might you work to minimize those conflicts? 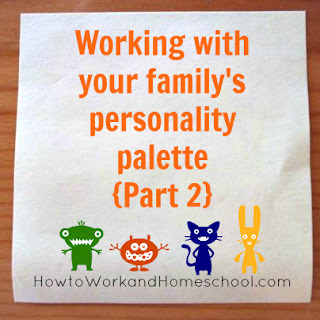 • What sorts of challenges and opportunities does your family’s unique color palette present to your plans to homeschool? • Reflect upon your own school experience. Try to guess the True Colors® for your favorite and least favorite teachers. Do the same for employers and supervisors. What might this mean about your own learning style? How might that impact your teaching style? • What does an awareness of your own True Colors® hue tell you about your lifestyle and work choices? In other words, what can you build upon? *Remember: While I am not certified True Colors® consultant, I do offer individual consultations and workshops to help you puzzle through the realities of homeschooling. 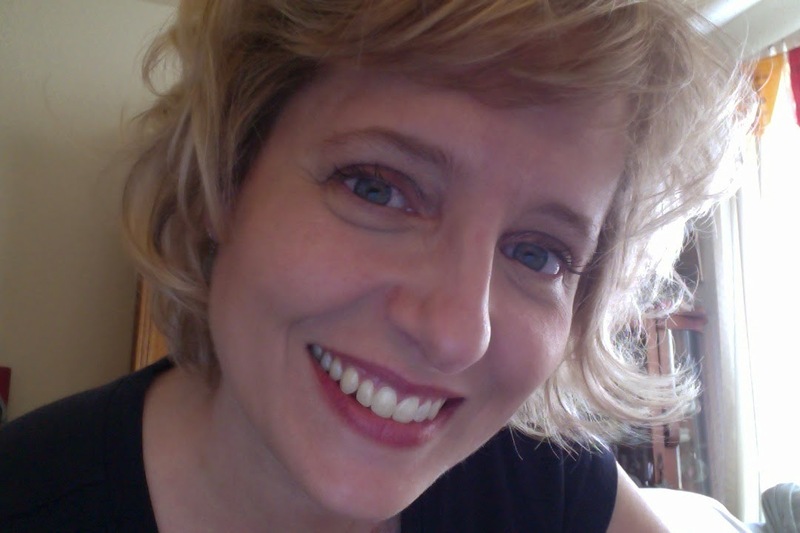 • Have a question about working and homeschooling? This post originally appeared at RedWhiteandGrew.com. If you're interested in learning how to homeschool your kids this summer, I'd really love to help you prepare for the experience! There's much to be said for good ol' summertime--the weather, the fun, and the much-needed vacation time. Yet summer can be, for families contemplating homeschooling in the fall, a wonderful opportunity to explore educational options and prepare mentally for the road ahead. 1. In the summer, our regular routine is broken. There's freedom in that, chiefly because we look at our lifestyle choices with fresh eyes. We see what is working... and what isn't. 2. The change in routine reminds us that we can adapt. The rest of the year--our calendars busy with to-do lists and set schedules, we parents tend toward pessimism and entropy thinking modifications to "the way things are" are impossible. 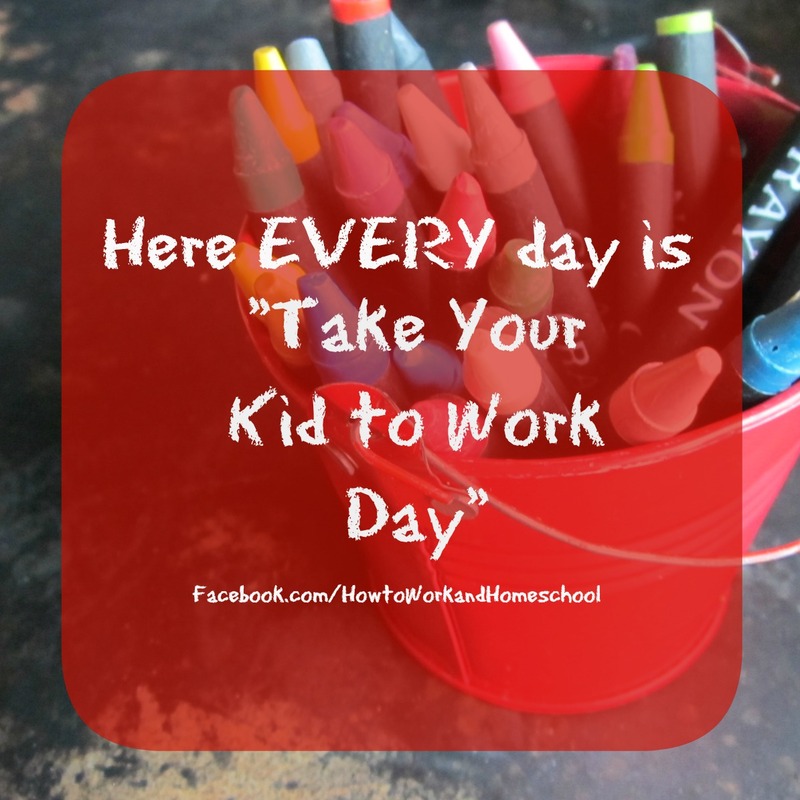 It's worth noting that in the summer many families--especially those who struggle with the idea of how to work and homeschool--find that there are resources available to them for daycare. Or they figure out how to cobble together a workable solution. The reality is that, in many instances, similar opportunities are available (or can be made available) year 'round. 3. June through August, museums and cultural organizations offer more outreach programming geared to youngsters. That's no accident. They are doing it on purpose, to generate ticket sales. 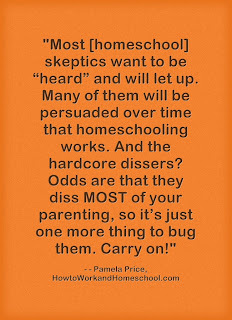 But per this post, many are starting to see the wisdom of targeting homeschoolers (including unschoolers, a sub-group) throughout the year. This is a trend that I've seen in our community. Again, you can use the summer months to scope out options that might supplement your family's curriculum during the school year. Keeping in mind that you don't have to schedule a full 8 hours to "teach" your kids, see what happens if you intentionally allocate some time to learning. Truly, even 15 minutes a day playing a board game will be helpful (especially if you are inclined toward unschooling). Remember: keep your expectations in check. There will be some trial and error. That's natural, especially as you figure out what works. 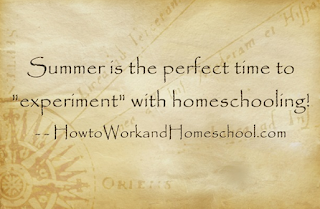 Yet with practice you will likely discover that homeschooling is a lot easier than it sounds. 5. 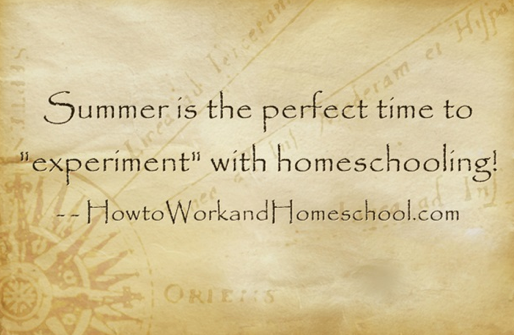 Whatever the outcome, experimenting with homeschooling in the summer helps with learning retention. Let's say that you decide to return your child to public school in the fall, even after you've tinkered several weeks with homeschooling in the summer. Odds are that your kids will remember a bit of it heading into the fall. Yes, even if you just focus your energy on practicing skills that they learned the year before, your "pupils" will be better prepared for returning to the classroom. As the only child of a disabled elderly adult--and as someone who has her own autoimmune disease, I have spent a fair amount of time in doctor's office waiting rooms over the last few years. On those days--and assuming that the topic of the appointment is age-appropriate, I take our homeschool kiddo with me. This gives him a glimpse into the role of caretaking without placing burdensome expectations upon him. More often than not, we bring along or encounter a hidden lesson tucked into our shared experience. For instance, I've noticed in the time that we've accompanied my wheelchair-bound mother places, he's become more sensitive to and respectful of the physical limitations of others. 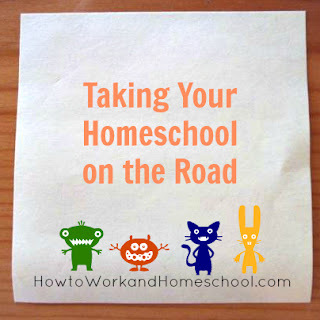 Homeschooling "on the road" works well for us. 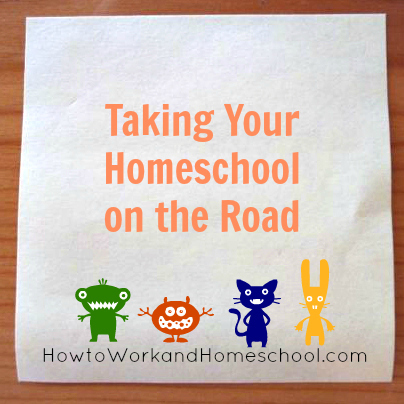 We're eclectic homeschoolers which means that we're fairly free-wheeling about our schedule. Lately we've become fond of educational iPad apps, which are highly portable by nature. We also "carschool" a fair amount, discussing ideas, experiences, Minecraft, and listening to French and Spanish language CDs in our commute. Just because we homeschoolers live in the same place doesn't mean that we all have the same approach. Many families here are strict traditionalists who utilize workbooks heavily; I call them "traditionalists" because they largely model their school days after traditional public/private school models. Yet they can be as mobile as they need to be, too. When we've encountered them "out and about," their kids often use a rolling carry-on bag, small suitcase, or backpack to transport items. One parent I know drives her children to the park and has them finish their lessons prior to play-time! Other parents find that "getting the wiggles out" in a park, followed by a light snack, is the perfect way to prep for school en plein air. A person's comfort level with mobile homeschooling, while tied in part to one's teaching/learning style, grows through practice. Basically, the more you do it as a family, the more comfortable you become with it. Homeschooling is as portable as you need it to be and can be interwoven into your day to the extent that you're willing to allow it. Disclosure: This post contains a link to my Amazon.com store, through which I receive a small compensation when items are purchased. This post originally appeared on my Sulia page in early 2013. 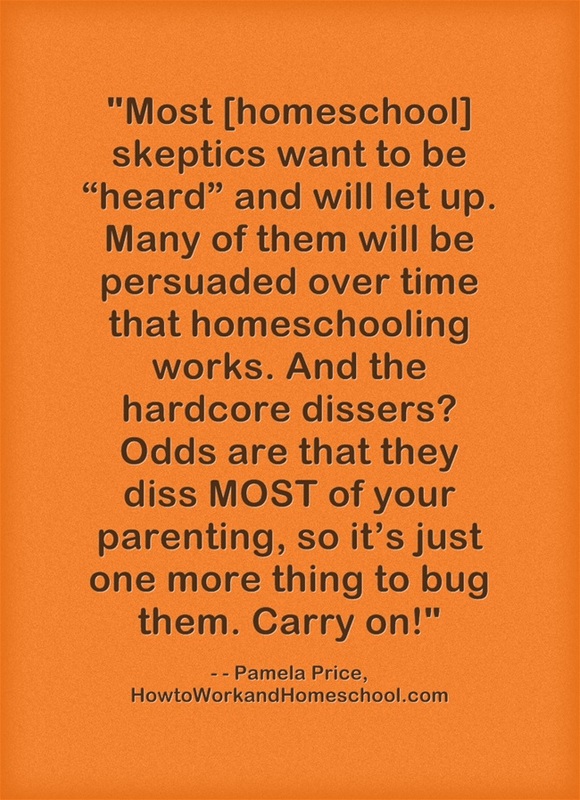 It’s quite common to encounter skeptics and naysayers of the decision to homeschool. Yet when you’re starting out as homeschool family, the negative “static” can interfere with your gaining confidence. Some of these pooh-poohers and their rants or “friendly, desperate pleas” aren’t worth more than a smile and friendly nod. But if it’s YOUR Mom or Dad (or inlaws or adult siblings), then things get tricky. Tell them that if they violate that rule, then they cannot give you annual feedback during your family’s homeschool years. That’s it. Most skeptics want to be “heard” and will let up. Many of them will be persuaded over time that homeschooling works. Odds are that they diss MOST of your parenting, so it’s just one more thing to bug them. Developed by Don Lowry in the 1970s and drawing upon personality composites that date back centuries as well as twentieth century clinical psychology, the True Colors®* personality identification technique provides homeschool parents with a framework for understanding what makes us (and those around us) tick in a variety of relevant settings: home, school, and work. A greater understanding of personalities, differences, and worldviews helps diffuse conflict and point the way to richer, more meaningful interactions. Ultimately, you can enhance your understanding of what all parties need to have a satisfying, customized home education experience. The four colors in the True Colors® model are Blue, Gold, Green, and Orange. When one is working with these personality descriptions and attempting to determine which one most accurately describes an individual, it is helpful to list them in descending order (1 to 4) from most pronounced to least pronounced. The ranking reminds us that we have all the colors and the attending traits within us, to varying degrees. In reminding us of our similarities, we are less tempted to "bash" colors different than our own. In my how to homeschool workshops, when I've assigned online readings (such as this one) on the topic of True Colors®, parents have responded favorably. As the participants have shared their family's "color palette," I've noticed that there are certain composite color characteristics of homeschool parents and children. Synthesizing what I have seen recently together with my experience as a career counselor in a university setting that used True Colors® as a coaching tool, I've typed up the following brief descriptions, color coding them to make it easier for visual learners to perceive the differences. Blue: Blues are the peacemakers and peacekeepers, prone to want to please. For better or worse, they seek harmony and like to minimize, defuse or even outright avoid tension unless a major principle is violated. They can be passionately assertive if provoked! Blues enjoy helping others and appreciate being noticed for their caretaking efforts. As homeschool students they are among the easiest to teach; most Blues are comfortable with everything from workbooks and large-scale projects (both group and individual). In the working world, they are found in a variety of worlds, including caretaking and creative professions. Gold: These folks are the traditionalists, taskmasters, and keepers of order. They thrive on clarity, routine, and structure and they like to have a clear sense of measurable progress. As students, they are most comfortable with clear-cut curriculum, including workbooks, that presents instructions in a step-by-step ("stepwise") fashion. As homeschool parents, they may struggle with how to do homeschooling "right," when in truth there are many good paths to success. Golds gravitate toward working in institutions and in organizations heavy on honoring hierarchy and with meticulous rules about behaviors and procedures, including the military. Not surprisingly at least one researcher has noted that they are highly represented among today’s K-12 teachers and school administrators. Green: Driven by thoughtful curiosity Greens are prone to question authority and defying convention not to be argumentative but rather because they have a keen eye for weak rationales. Many of my parents with gifted/2e kids have described their children as being Green. These individuals will respond positively to people and structures that they respect and believe to have integrity. Greens typically enjoy being self-directed in their educational pursuits and are apt to carry intense passions and interests into adulthood. Project-based learning is terrific for them, and some homeschool children thrive with unschooling, too. As adults they gravitate to work and hobbies that rely heavily upon the strength of their reasoning abilities and their deep need for intellectual stimulation. Orange: Vibrant by nature, Oranges are prone to extroversion. They enjoy trying to juggle a crowded schedule and may be “movers and shakers” socially. 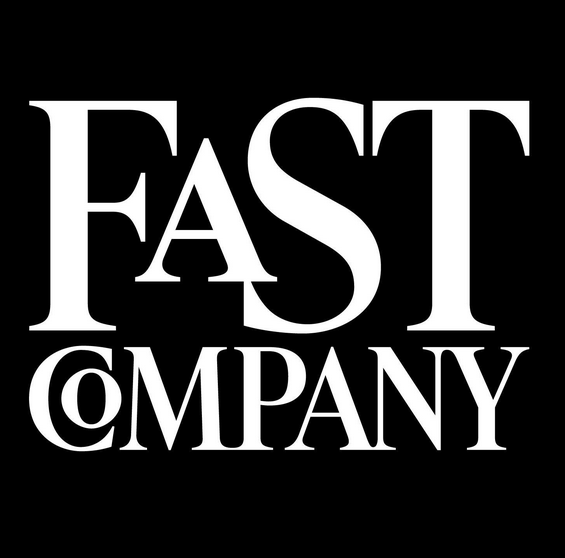 They are playful learners (“class clowns”), employees, and parents, but they can be fiercely competitive and tenacious as well. Oranges thrive on interaction and action and relish hands-on activities from childhood to adulthood, making them good candidates for project-based learning and unschooling (like Greens). They long to connect with others in a way evocative of Blues, but in a more robust, even irratic fashion. Oranges tend to gravitate to artistic fields, especially design and performance, or they find ways to integrate creativity into their otherwise seemingly ho-hum lives. Also, if you'd like to learn more about True Colors® in particular, I strongly suggest that you look at Mary Miscisin's web site, where you will find a terrific free online personality assessment. She also has a great section of her site dedicated to "color lingo in the classroom" which can be useful in a homeschool or afterschool setting. *Remember: While I am not a certified True Colors® consultant, I do offer individual consultations and workshops to help you puzzle through the realities of homeschooling. I'm comfortable coaching families with bright, colorful palettes who are struggling to establish themselves as home education or experiencing personality clashes. All conversations are confidential. Let me know if I can help you.